One of the long-awaited features the iPhone 3.0 software update brings to the iPhone and iPod touch—specifically, the iPhone 3G and 3GS and the second-generation iPod touch—is Bluetooth’s Advanced Audio Distribution Profile (A2DP). A2DP lets you stream stereo audio to other devices over Bluetooth; for example, so you can listen to music and other audio through wireless headphones or speakers or a Bluetooth-equipped car audio system without having to connect any cables. We briefly covered this new functionality in our review of the iPhone 3.0 software, but here’s a more in-depth look. I tested A2DP with an iPhone 3G, an iPhone 3GS, and a second-generation iPod touch, connecting each to two different A2DP accessories: Altec Lansing’s inMotion SoundBlade speaker system and BackBeat 903 stereo headset. Although neither device is officially Made For iPhone—no Bluetooth speakers or headphones are yet—both are standard A2DP accessories. 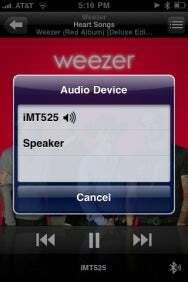 Once the accessory is connected, all audio should automatically be sent to it. This includes audio from the iPod app, as well as sounds from games and other apps. If your iPhone or iPod is set to automatically check for e-mail, or you’ve enabled push or notifications, alert sounds are also played through the wireless audio accessory, with music fading out briefly when alerts sound. Oddly, this audio-device screen is also the only way to switch audio back to the iPhone or iPod's own outputs apart from turning off the accessory or unpairing the two devices—not an issue if you’re already listening to music, but a hassle if you’re doing something else. I also occasionally experienced an issue where turning off an A2DP Bluetooth accessory before switching audio output back to the iPhone prevented me from restoring audio on the phone; I had to turn the accessory back on, wait for it to connect to the phone, switch audio routing back to the iPhone itself, and then turn off the accessory again. Once you’re streaming over Bluetooth, you control playback volume via controls on the external accessory; the iPhone or iPod’s volume buttons are disabled when streaming stereo audio. This provides a consistent signal level, but it does have some drawbacks. The most obvious is that if you’re streaming to a speaker system across the room, it can be a hassle to change the volume. But I also came across another issue: The Altec Lansing BackBeat 903 provides only three or four volume “steps” when used as a stereo headset, and the lowest level was still too loud for me in a quiet room; I don't know how many other stereo headsets share this quirk. (If you’re using an A2DP device that also lets you take and make phone calls—more on this below—you’ll still be able to adjust call volume via the iPhone’s volume controls.) It’s also worth noting that you can't send non-phone-call audio to a standard (mono) Bluetooth headset. Of course, as with most Bluetooth accessories I’ve used, you can confuse things by answering calls on the phone itself. For example, in my testing, answering a call on the phone—by tapping the Answer button on the phone’s screen—caused the phone to reroute call audio from the SoundBlade or BackBeat headset to the phone; I had to manually route it back to the Bluetooth device. And if I answered a call on the phone while music was playing, when I hung up the call and playback resumed, audio was played through the iPhone; I had to manually switch back to the headset or speakers. If you’ve got multiple Bluetooth accessories—for example, a standard phone headset and a set of A2DP speakers—things get a little messier. 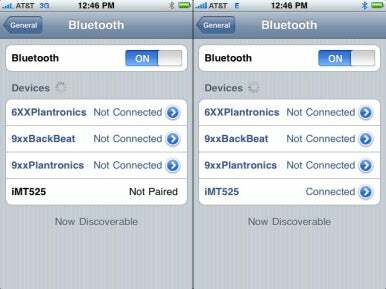 While the iPhone and iPod touch can be paired with multiple devices simultaneously, only a single Bluetooth accessory can maintain an active connection with the iPhone or iPod at any time. If you’re listening to music through a Bluetooth speaker system and a phone call comes in, you can answer the call on your favorite Bluetooth headset by pressing the headset’s Connect button to connect with your iPhone, but doing so drops the connection with the speakers. When the call is over, you must reconnect with the speakers (which disconnects the headset). Bluetooth audio streaming is mighty appealing, but it’s not without caveats. For audiophiles, the most significant is that audio is lossily compressed in order to avoid saturating the Bluetooth connection—nobody likes stutters and skips when listening to music. But the reality is that unless you have a set of high-end wireless headphones or you’re streaming to a very good stereo system, you’re unlikely to notice this compression, especially if you’re playing low-bit-rate audio files. (Etymotic’s ety8 is the only true high-end set of A2DP headphones I’m aware of right now.) You’d surely be more annoyed if playback was choppy. Speaking of which, during several days of A2DP testing, audio playback over Bluetooth was generally smooth. The one thing that regularly produced a skip or stutter, mainly on the iPhone 3G with its slower processor, was checking for and receiving new e-mail. To be fair, such events often bog down whatever the iPhone is doing; games regularly slow to a crawl when the iPhone receives new messages. The faster hardware in the iPhone 3GS and iPod touch made this much less of an issue. Finally, I experienced a few occasions on the iPhone 3G where WiFi signal strength dropped while streaming audio over Bluetooth, although this didn’t happen every time (and it didn't happen at all with the iPhone 3GS). Perhaps the biggest drawback of A2DP Bluetooth streaming is its effect on battery life. As anyone who’s undertaken extended Web-browsing sessions on their iPhone or iPod touch can attest, wireless connections and long battery life aren’t good friends. And while Bluetooth doesn’t require as much power as WiFi, streaming audio over Bluetooth noticeably shortens your battery life. I didn’t perform any controlled tests, but my anecdotal observations over several days of use indicate that A2DP streaming cuts battery life at least in half. We’ll be getting our curious hands on an iPhone 3GS later on Friday, and we’ll start testing these features to see if Apple’s latest phone handles A2DP and AVRCP any differently. If so, look for an update to this article to reflect those differences. UPDATED 6/30/09, 12:30pm: Updated article after testing A2DP with the iPhone 3GS.